at 4:00 p.m. on Friday, 28 December 2018, in the Seminar Hall of the Centre for Society and Policy (next to the Health Centre), IISc. 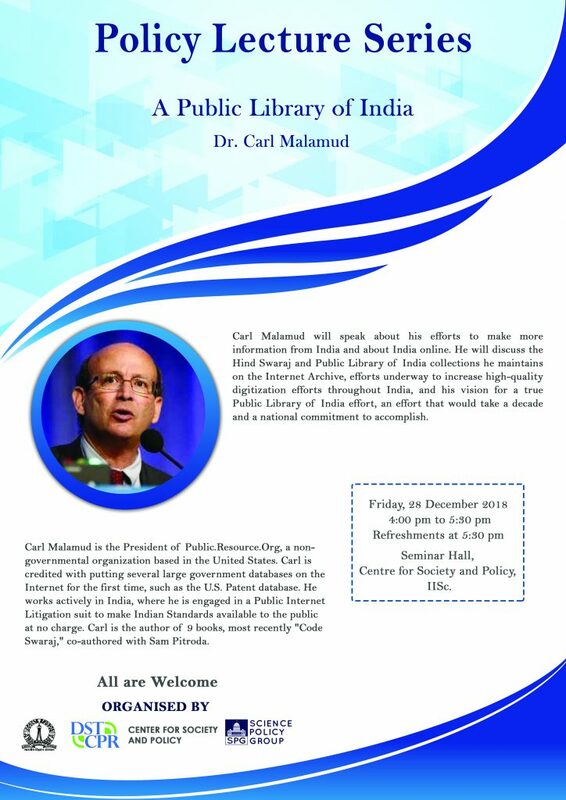 Abstract: Carl Malamud, founder of Public Resource, will speak about his efforts to make more information from India and about India online. He’ll discuss the Hind Swaraj and Public Library of India collections he maintains on the Internet Archive, efforts underway to increase high-quality digitization efforts throughout India, and his vision for a true Public Library of India effort, an effort that would take a decade and a national commitment to accomplish. Speaker Biosketch: Carl Malamud is the Founder and President of Public.Resource.Org, a nongovernmental organization based in the United States. He was previously founder of the Internet Multicasting Service, a nonprofit that started the first radio station on the Internet and was responsible for making the SEC EDGAR database available. He is the recipient of the Berkman Award from Harvard, the Pioneer Award from the EFF, and the Bill Farr Award from the First Amendment Coalition. Author of 9 books (including “Code Swaraj” co-authored with Sam Pitroda), Malamud works actively in India as well, and is engaged in a Public Internet Litigation suit to make Indian Standards available to the public at no charge.